In August 2012, one vintner’s dreams became reality when Pepper’s Ridge Winery opened its doors. When owner, Kevin DeWeese, decided to turn his hobby into a business he decided to make it a family business by honoring his father and grandfather whom were both nicknamed “Pepper.” Pepper’s Ridge specializes in fruit wines; including flavors like Bird Dog Blues, a berry blend and Knob Hill Quencher, another blend of grapes and berries. Pepper’s Ridge takes pride in supporting other local businesses and purchases most fruit locally; for instance, all the peaches for the Lakeview Peach come from Lakeview Orchard which it is named after. 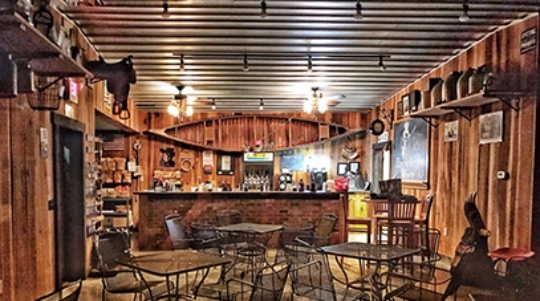 Decorated with old-fashioned hand tools, antique pitchers and jugs against a bare-wood interior provide the winery with a charming, rustic atmosphere. Wednesday through Sunday, visit Pepper’s Ridge Winery with a picnic basket and enjoy a bottle of wine while you enjoy the nice country view. On Saturdays you can enjoy live music with your wine! So kick back and cowboy up (Cowboy Up Red (catawba) or Cowboy Up White (pineapple)) in the woods with Pepper’s Ridge winery!